We are so thrilled to announce our special guest for our screening of The People vs. Fritz Bauer on Wednesday Night! Award-winning journalist and author of six books, Andrew Nagorski, will join us via Skype following the film! The last living remnants of the Holocaust, the notorious Nazi war criminals and those who doggedly hunted them, have all but faded away. 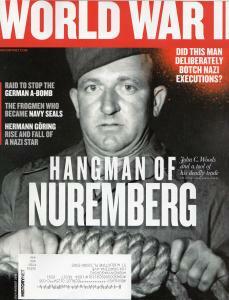 On newsstands now... the July/August edition of World War II Magazine, featuring The Nazi Hunters as the cover story.